A great meatless meal that is satisfying and easy to make. I serve with a side of sautéed spinach w/garlic and a shake of the Antler Rub. A fast and easy meatless dish. Preheat oven to 450. Brush the cut side of the squashes with the olive oil. Place cut-side down on a baking sheet lined with foil or parchment paper. Bake for 25 minutes. Meanwhile, in a large skillet, heat the garlic with 2 Tbs of water. Add the onion, apples and mushrooms. Saute for 7-10 minutes, or until the veggies soften. Stir in the sage. I transferred the squashes to a baking dish which made it easier to stuff them without them falling over. 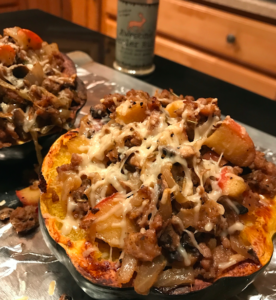 Stuff with the apple-mushroom mixture and topped with shredded Parmesan cheese. Bake for another 10 minutes and enjoy!